So this film is all about your mother. Almodóvar: Maybe it should have been called All About My Mother Part 2! In fact, my mother is present in the whole movie. More even here than in All About My Mother. In this case, all the locations were the places that I used to live when I was a child. Her presence here was much stronger. And also because I’m talking about my roots, when I go back to La Mancha, it’s like going back to my mother’s breast. La Mancha is represented for me more than in the language itself or the geographical region; it’s more the memory of my mother. I lived there for my first eight years, and my mother brought with her La Mancha. She was very much from that place, and she always spoke in the way they talked in La Mancha. There, we have a very special way of talking – we have a dialect that is very specific to that place. My mother always talked like that, so she always represented to me La Mancha. Why are women so central in your films? Almodóvar: I did films with men like Bad Education, that have only men in them, and also Law of Desire, where Carmen Maura played a man. But it’s true that women tend to be at the centre of my movies. I don’t know why. Probably because women are more interesting as a subject to develop a story around. I wouldn’t say that women and men have different problems; they have the same problems, they have the same joys and they have to also suffer the same things. But I think women have more freedoms to express their feelings and emotions. They are less shy and have less prejudice too. I think women can surprise us much better, probably because for centuries women were forced to live in silence in the shadows. When I started writing the script for Volver, I knew I wanted to write only about a female universe. And because this film is related to the memory from my childhood: when I grew up, I was surrounded by women, men were not there. Why did it take 18 years to reunite with Carmen Maura? Almodóvar: Well, in fact, at the beginning, we just separated for personal reasons. We broke up. It was a very intense relationship – it was like a couple! We were like three or four years without talking, but after that time, we became friends. And since then, I didn’t really have a part that I thought was right for her – and when I had it, I immediately asked her to do it. This film is more serious than the previous films you did with her. Do you think you’ll work together on another comedy? Almodóvar: I would like very much to shoot again with Carmen Maura in a film, but first I must write a role for her. I would like very much to be able to write a crazy comedy for her. Carmen Maura is someone that has a natural capacity for drama and comedy – and both things at the same time. She has an extreme sense of humour – but it depends on the script I like. When I write a script, it’s an idea that comes to my mind and she takes possession of my mind, and I’m at her service. I write what the idea wants me to write. I’m not the owner of my own stories. These stories are the owner of my mind. It sounds like my brain is taken by an idea. Is it true Penélope Cruz was too thin originally to play this role? Almodóvar: It’s true that the only false thing in Penélope Cruz in this film is her arse! We had to make her behind bigger. First of all, my reference for the character was the Italian movies of the ’50s, where women tended to be plump. So giving her a bigger bottom gave you the impression that she was a woman closer to the Earth. I wanted to change her way of walking. Penélope has done ballet when she was younger and that gave her a very gracious and light way of walking. I wanted her to have more weight, so you could feel the sense of gravity attaching her to the Earth. Another idea for that was she’s a very strong woman – the character she plays is a fighter. She never gives up. And she’s also a mother. So for me, the idea of motherhood, the symbol of motherhood, would be Anna Magnani in Bellissima. In the film, the females blossom after the men have died. Almodóvar: In La Mancha, men tend to die naturally much younger than their wives. And those women in La Mancha, of course they have a feeling of nostalgia – they miss their husbands. But it also gives them an opportunity to lead their own lives. They have more of a life among women – they see much more of their friends, they have a much more quiet life, a much more peaceful life, a much more feminine life. In this film, Penélope plays a young widow. But she blooms not because she’s widowed but because I decided I wanted her to bloom. I like her very much – she’s very pretty. And I wanted to show that even though she’s a poor woman, a cleaner, and comes from a little village, and has no money, she could also be very attractive. Also, Penélope has blossomed herself in this moment of her life. I’m sure that I’m going to work with her again. What’s else is next for you? 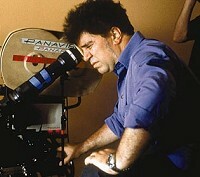 Almodóvar: I would like to be able to go on doing cinema with freedom and independence. I would like to be able to keep my imagination alive. I would like to be able to go back to the films I used to do, which had a greater sense of humour. My last five films – the ones that gave me my best reputation – are the ones with more drama and less humour. And I would like very much to be able to go back to that joyful, humorous period of my life. Definitely, I would like to go on doing film without suffering any pressure or interference from outside. And also I would like to forget that everything has an end, because for me, at this moment of my life, there is a big crisis: it’s this idea of death. I do not accept death. And I think this is something I show in the film. This is why I have done the film and why I talk about people in La Mancha. People there are completely different from me; for them, death is something in everyday life. It’s something they accept and is something natural – not a tragedy. Will you ever try working in Hollywood? Almodóvar: I think it’s a danger when you decide to change the language you speak or your culture when doing a movie. I think, in my case, I would probably lose part of the richness in my films, and also the details that fill them. Another reason that’s probably more important is that Hollywood will probably never allow me to have the same degree of independence and freedom I have now. My films are like handicraft work – I intervene in all processes, at all the levels. In Hollywood, there are many people making decisions – not just the director. So this is why I don’t think I will be able to work in the Hollywood system. And why is there so much red in your films? 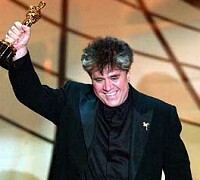 Almodóvar: Red is an instinctive choice for me. Of course, I love the colour red very much. But I suppose I use it because it gives an intensity to the place where you use it. It’s a very expressive colour, and in Spain red also represents life, fire, death, blood, passion and carnations – which is the national flower. From a technical standpoint, if you’re filming a night scene, red will give a certain brightness. And this is why normally I always put a touch of red on my women in a night scene – a cardigan, a sweater or something. Also, this is the reason why all the cars are red in my movies. If you put a red car in the countryside, red enhances the natural colours.